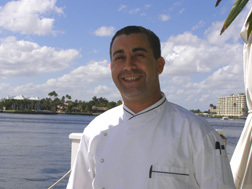 Djillali Mezali, better known as "Chef G," is the magician in the kitchen of The Secret Garden at The Pillars at New River Sound in Fort Lauderdale, Florida where he uses an intriguing mix of spices and herbs to enhance his creative menu which he changes daily. While I was in Fort Lauderdale in March 2009, I stayed at The Pillars at New River Sound, a stunning and luxurious 22-room and suite hotel located on the Intracoastal Waterway, and had dinner at their restaurant, The Secret Garden, where I had the opportunity to meet Chef G.
Born in Algiers and trained in London at a prestigious culinary school, Chef G honed his culinary craft working in Mexico City before moving to work in Fort Lauderdale 15 years ago where he fell in love with the climate, the atmosphere, and the fresh ingredients available. He joined The Pillars at New River Sound in September 2008 where fortunate guests staying at the hotel can experience his talents at The Secret Garden. When I asked Chef G about his vision for the restaurant, he explained that he changes several items on the menu daily based on the freshest ingredients that he finds at the market where he shops each day. Spotting Chef G arriving at the hotel laden with his latest market finds, I eagerly looked forward to experiencing dinner, as we discussed his plans for the swordfish which he had just purchased, and would sauté in olive oil and present it Mediterranean style with a white wine lemon butter sauce, calamata olives, tomatoes, capers, and fresh mint chiffonade, accompanying the swordfish with saffron jasmine rice and grilled asparagus, and I knew that this dish would be magical with all that freshness. Sampling his recipe for Butternut Squash with Star Anise, Ginger, and Lump Crabmeat Soup, what I especially appreciated was his subtle layering of flavors and the interesting combinations of his ingredients. While butternut squash and ginger are lovely companions, his addition of star anise, an often under utilized spice was brilliant, the lump crabmeat added texture and luscious flavor, and the hint of cayenne pepper added another spark of interest to this very tasty soup. Chef G's presentations are thoughtful and attractive, because as he so aptly stated, "when you see the food, you first eat with your eyes." When he is not working in the kitchen and creating new recipes he enjoys seeing movies, swimming, when time allows, fishing, and not cooking at home. He graciously provides his recipe for Butternut Squash with Star Anise, Ginger, and Lump Crabmeat Soup to tempt your palate and your eyes. Method: Sauté shallots, garlic, and star anise in butter in a 3-quart heavy saucepan over moderate heat, stirring until shallots and garlic are softened, approximately 5 minutes. Add the squash, wine, stock, cream, and simmer uncovered until squash is very tender, approximately 20 minutes. Remove the star anise. Puree the soup in a blender until very smooth. Transfer to a clean pot, sprinkle crabmeat and cayenne pepper, and bring soup to a simmer and season to taste with salt and white pepper. 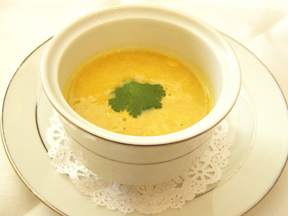 Presentation: Divide the soup among eight shallow bowls and garnish with cilantro sprigs. The Secret Garden is open six days for guests of The Pillars at New River Sound. Read other articles on The Pillars at New River Sound in the Hotels and Resorts and Restaurants sections.